As part of the SoundaXis ‘08 festival of new music, texture, and material in Toronto, I stumbled upon a thought-provoking installation presented by the New Adventures in Sound Art. 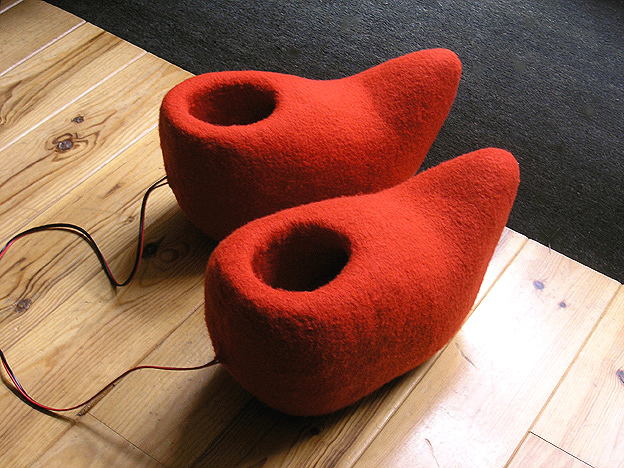 The “Super Sonic Sound Scape Shoes” by Amsterdam based sound-sculpture artist Ricardo Huisman is comprised of a pair of gigantic red woolen shoes that participants at the art exhibit can stand in. Instead of only hearing a soundtrack that Ricardo has prepared on CD, listeners were invited also to feel the sounds under their feet while wearing the super shoes. Sounds not only hit the feet, but vibrations at various frequencies were also felt as they traveled very subtly up the body. Ricardo’s specially composed sonic portraits with imaginative narratives help the public to “get in touch” with sound in a tactile way. For those of us familiar with electronic music, the concept of music being a physical experience in the body is not at all foreign. What struck me most about this exhibit was an immediate memory of feeling the bass for the first time at a ‘rave’ many years ago. For decades, techno music productions have arguably been emulating bio-rhythms such as the heartbeat or the breath, and they inspire movement of the body. What also came to mind while sitting in a chair with the super shoes, was the recollection of the film, “It’s All Gone Pete Tong”, in which the deaf Frankie Wilde is able to DJ by placing speakers under his feet and feeling the bass. According to Ricardo Huisman, it’s not surprising that people who are hearing impaired and have experienced his sound-art installation have been able to enjoy the soundscapes he created. He said he works with frequencies in a much larger range than your average pop music and he enables a sensory experience that everyone can feel, although some people are attuned to a larger range of frequencies than others. All the sound sculptures have their own tactile sonic character with their own form and (sound)colors. I call them “multi sensorial tactile interfaces”, because they trigger several senses: hearing, seeing, haptic / touch / tactile. The special “touch-soundscapes” I composed for the “super sonic sound scape shoes” can be (re)created, and remixed in the context of the location, presentation, public, etc. For the presentation in Toronto I composed soundscapes of the sonic impressions and sound walks during my first day’s in Toronto with spontaneous interviews with people about the meaning of sound in the specific location of meeting.They are a mixture of soundscapes, field recordings, city sounds, voices, silence and noise, musical and non-musical sounds. I always compose in two basic layers: the audible and the touchable. Sometimes I do live tactile soundscape mixing-performances. I am specially interested in the interactivity and what I call the “multi sensorial hearing perspective”: (link), every body is creating their own multi sensorial experience / hearing perspective by standing in the “super sonic sound scape shoes”. The “super sonic sound scape shoes” triggers personal associations, (sensorial) sound memories and interpretations. The people will feel a sensory connection to the soundscape they experience. The “super sonic sound scape shoes” gives people the chance to become more aware of the multi sensory aspects of their own sound habitat and the way they are acting in it as listeners and performers themselves. What was it like when you tried out the shoes with people who are hearing impaired? I did present the “super sonic sound scape shoes” for people with hearing disabilities and deaf people. They also have their own hearing perspective based on the vibrations they can feel through the body, the skin, the organs, the ears (when they are not completely deaf). The associations and interpretations triggered by the “super sonic sound scape shoes” depended on their memories of heard sounds and felt vibrations. (some deaf people have still memories of heard sounds like hearing people have, when they became deaf during their life. People that never “heard” have memories when feeling specific vibrations connected to specific parts of their body. A deaf Asian woman standing in the “super sonic sound scape shoes” got memories about her mother-country when experiencing gong-like sounds; she recognized the vibrations. Other deaf people got associations with standing in the street surrounded by the vibrations of a big cars and traffic. I also created more musical rhythmic compositions with industrial sounds and heartbeats. For some people with hearing disabilities it was easier to hear the sounds in reality because they could easier concentrate on the heard and also felt sounds by standing in the “super sonic sound scape shoes”. Here you can find the link to presentations on Sense festival and Sencity for deaf, hearing disabled and hearing people in 2005 and 2006.